I’ve always felt the Central Asian countries to be exotic and mysterious, envisioning traders with caravans of camels bursting with spices and valuable merchandise, fighting against the whims of nature to reach distant lands. Central Asia has such a wild, infectious history due largely to the role it played during the heyday of the Great Silk Road, which makes sense. All of these countries were stopping points on the world’s most extensive trading routes in the world leading from China to the West. The Silk Road’s namesake comes from the large quantities of silk produced in the east that passed through it into the western world. However, its name is misleading in that silk was only one of the many items merchants carried across these land routes. It also helped transport products like paper, spices, ivory, gold, musical instruments, gunpowder, jade, exotic animals, and spices from one country to the next, creating a bond that knit together the nations of the world. The vast scope of the Silk Road’s routes helped induce globalization on a level never before known due to a constant exchange of ideas, merchandise, religions, and philosophies. 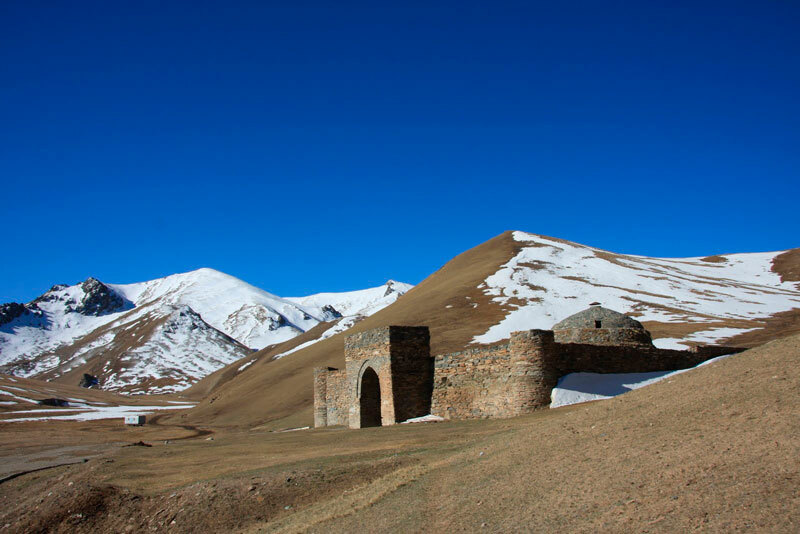 In Kyrgyzstan there are several historic Silk Road destinations for people interested in Silk Road history: Tash Rabat, Burana Tower, and Osh bazaar. 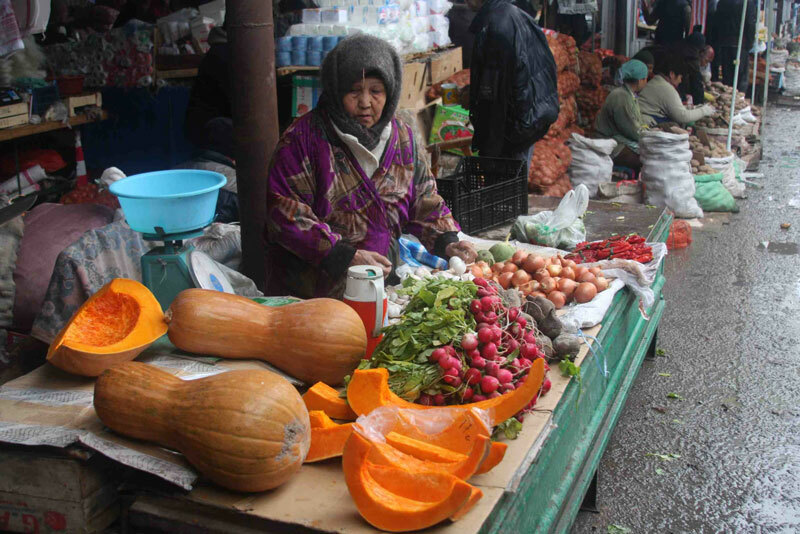 Kyrgyzstan is home to the Silk Road caravanserai, Tash Rabat. While Tash Rabat was originally built as a monastery, it was eventually converted into an inn for Silk Road travelers to provide shelter from the elements and protection from marauders and miscreants. Its structure is unique in that it’s a symmetrical building with a large domed room functioning as the center point and then sprawls out into 30 other rooms that are also domed. Tash Rabat sits at an elevation of 3200m in the remote mountains of the At-Bashi province. 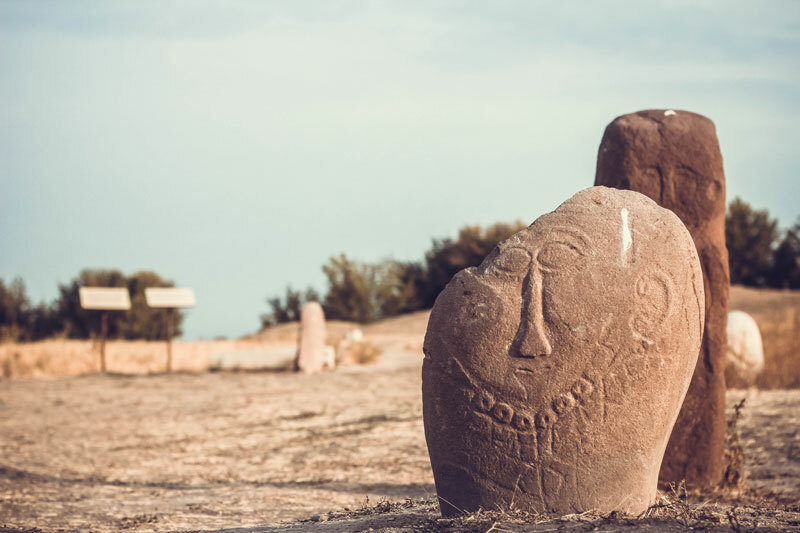 If you’re a history lover, you’ll definitely enjoy visiting Tash Rabat and its surrounding natural beauty. Burana Tower is a stately minaret positioned along the Silk Road that’s shrouded in legends. Around the tower you can see a field filled with stone statues that resemble small, ancient warriors as well as a modest little museum that showcases ancient coins, jewelry, and the history of Burana Tower run by a local family that can provide a guided tour of the museum (in Russian) and more information and legends about the tower itself. There’s also a yurt set up next to the museum where you can buy souvenirs. 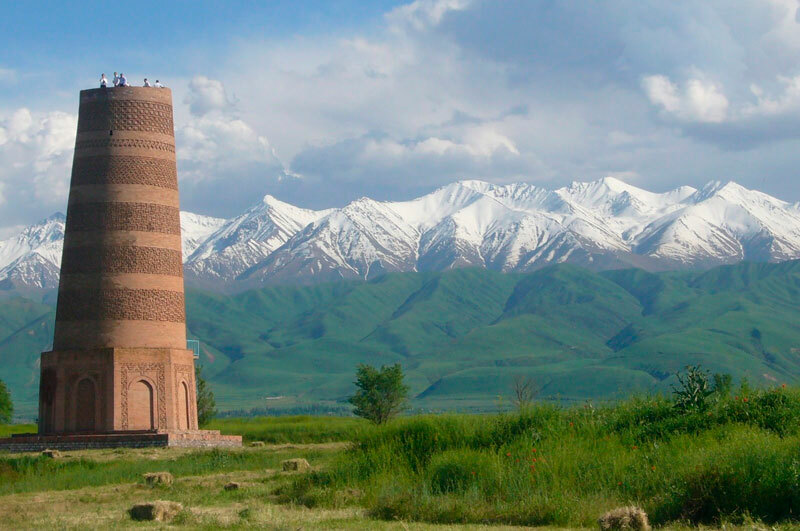 Burana Tower is located 80km east of Bishkek near a town called Tokmok and provides a nice day excursion out of Bishkek. Entrance fees for the tower and museum are budget-traveler friendly and the scenery around the tower is lovely. When it comes to history, the places I enjoy the most are the ones that still interact with the modern world, which is why the Osh bazaar is so fascinating to me. The bazaar in Osh is said to be 3000+ years old, was a famous trading point on the Silk Road, and is still in operation today! While you’re in the bazaar, you can just picture traders buying, selling, and haggling in the midst of a jungle of goods during Silk Road times as you do the same thing now in the 21st century. It’s an exciting stop to make during your travels and gives you the chance to try your hand at some friendly bargaining with bazaar sellers at a modern Silk Road stop. 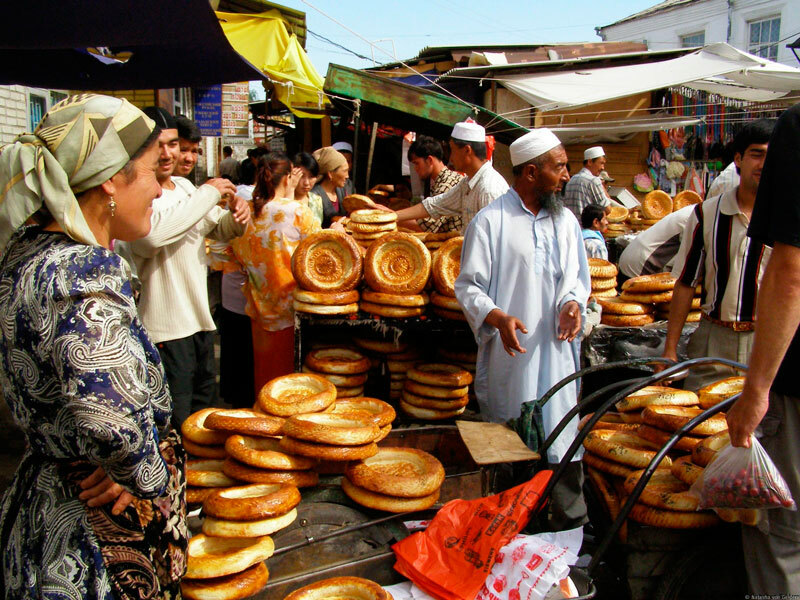 All these destinations will breathe more life into your knowledge of the Silk Road. Incidentally, if you make it to all of them, you’ll also get a nice overview tour of Kyrgyzstan on the way. You’ll go from north to south and travel through some of the most beautiful mountain ranges in Kyrgyzstan. Even if you’re not normally into history, check out at least one of them. You’d be surprised at how much you’ll find yourself enjoying Silk Road destinations in Kyrgyzstan! The price depends on a group size. The price 1600 USD per person is available for groups of 4 people. The price depends on a group size. The price 1230 USD per person is available for groups of 4 people. The price depends on a group size. The price 1250 USD per person is available for groups of 4 people.